Lightly roasted and salted Pistachio is one of the most favored processed Pistachios all over in the world. This item is good for people who are on a salt—free diet. Lime gives the pistachio a special enhanced flavor. These are prepared from closed month Pistachio prior to shipment, therefore have a very fresh flavor. 6-Closed mouth pistachio in shell. 1- Round type. A.k.a. "Fandoghi" available in sizes 26/28,28/30 and 30/32 2 - Long type. A.k.a. "Badami"
5 - Jumbo type A.k.a. "Kalleghuchi" available in sizes18/20 ,20/22 , 22/24 and 24/26. 1- The Round type has the greatest share in each year’s crop. 2- The measurement unit of pistachio is the No. of nuts in each ounce. Part of each year's crop is turned into pistachio Kernels also there is a special type of pistachio which is greener in color and is used in production of Green skinned Pistachio Kernels. Both of the above are in great demand all over the world. Pistachio also contains sodium, potassium. iron ,calcium . 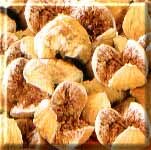 In Addition to pistachio we also supply Iranian Dried Figs. Iranian Figs are dried while still on the tree, therefore they acquire a very special taste and flavour and they are a rich source of vitamins and energy .